Latitude Margaritaville might have plenty to do in the community, but Daytona Beach doesn't lack options either. If you know the lyrics to a dozen or so Jimmy Buffett songs and salt life is more than just a sticker on your car, you might want to consider a home at Latitude Margaritaville in Daytona Beach, Florida. It’s a community for Parrotheads 55+ who are still looking for their cheeseburger in paradise. You don’t have to be a Buffett fan to live at Latitude Margaritaville, all you have to want is a laid-back, tropical lifestyle. Just prepare yourself for a lot of Buffett-inspired amenities, such as the Barkaritaville Pet Spa. This collection of 6,900 single-family homes built by Minto will focus on resort-style amenities, a huge retail area, and an amphitheater for, you guessed it, concerts. Active adults who choose Latitude Margaritaville will be glad to know that there's much more to the community than just what's inside. Daytona Beach has a lot to offer. 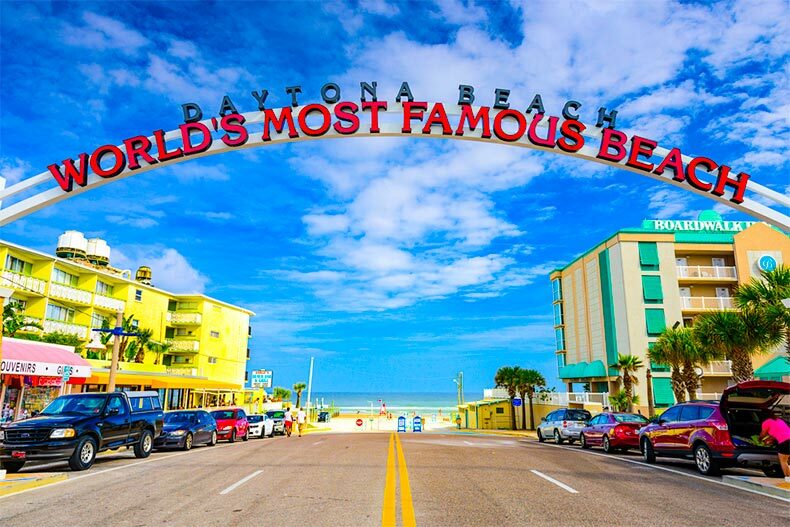 There’s the sunshine and NASCAR of course, and these five things to do in Daytona Beach that you might have missed on a previous visit. Fresh and local foods and crafts are on the menu at two of Daytona Beach’s most popular outdoor markets. Start with the Daytona Beach Downtown Farmers Market. It's open every Saturday from 7:00 a.m. until noon on City Island near the Jackie Robinson Baseball Field. It’s a pet-friendly place to buy fresh, local food and plants. There’s also the Daytona Flea and Farmers Market, which has been rated one of the best markets in the U.S. by Fodor’s Travel and USA Weekend. It’s open Friday through Sunday, and in addition to food, you can find unique vendors and special exhibits. Just 15 minutes south of Daytona Beach is Ponce Inlet and its lighthouse, which is a National Historic Landmark. It’s the tallest lighthouse in Florida, and the second-tallest lighthouse in the U.S. If you’re up for climbing 203 steps you’ll be rewarded with an outstanding view at the top. The museum provides a great history lesson in Florida’s maritime culture. Daytona Beach sits on the Atlantic Ocean and is home to 23 miles of sand and surf. You can even drive on the beach at certain access points. At Daytona Beach, you’re free to create whatever kind of beach experience you want. Relax on the sand, swim in the waves, or take a surfing class. You can rent a kayak if you’d prefer to enjoy calmer waters or join one of the many fishing charters that leave from Daytona Beach’s coast. On the boardwalk and pier, you’ll find shops, restaurants, and old-school amusement park rides. Florida has the most golf courses of any state and some of the most scenic ones are in Daytona Beach. Check out the 36 holes at LPGA International, where you can tee off on the Jones Course or the Hills Course, both of which have been rated four stars by Golf Digest. You can also try Pelican Bay, and play either the North Course or the South Course. The Daytona Beach Golf Club is an affordable, public course that offers lessons and hosts events. When you’re looking for an opportunity to people-watch and have some fun after the sun goes down, check out Daytona Beach’s nightlife scene. There are bars, clubs, and restaurants that welcome patrons of all legal ages up and down A1A, Seabreeze Boulevard, and International Speedway Boulevard. If craft beer and artisan cocktails interest you, the Daytona Beach Ale Trail can offer you several sips of interest where you’ll find stimulating libations and local microbrews.